I was cleaning up my computer files and came across an old directory, “/From old Compaq.” I switched to Mac in 2008, so I didn’t hold much hope that anything I found there would be of help. Was I ever wrong! Apparently, I found some interesting things about Donna back in 2007, downloaded them for future analysis, and then forgot about them when I changed computers. Two of the files were clippings from “The Dallas Review” which showed Donna playing at the Melba Theatre in Dallas Texas in 1924. I may have wondered, at the time if it was really my Donna as there was so much wrong in the person’s history. I know a lot more about Donna’s career and know it is the right person, but there are still many items that will require additional research. Although I don’t recall where I downloaded “The Dallas Review” from, I was able to find the exact same articles in the Dallas Morning News from Genealogy Bank. Another set of files, that I’ll write about later, indicate Donna and Earl probably came to Dallas from Nebraska. Certainly, we know she was in Oakland, CA in early June and in Sheboygan, WI in the fall so this is a newly discovered venue for Donna to be at. In fact, this is the first venue I’ve found for Donna in the South. The only advertising I’ve found was a large ad showing Donna Darling and Earle as an Extra Added Attraction in a “Song and Dance Romance” (See below). Of course, the “Chin Chin” promotional materials were always careful to not say there were any leading ladies, let alone a “prima donna.” I, of course, still wonder about her winning any contests. I know of one contest in Boston that she entered and didn’t win. I suppose there may be another contest I don’t know about yet, but I definitely can do more research there. Also, I’m yet to find confirmation that she actually won a contest in New York. I’ve only found press releases for Donna that indicate she won. I originally thought that it was just craziness that Donna’s sister was the actress Grace Darling. Donna didn’t have any siblings (except for a half brother that died as an infant). Then I thought I’d look into Grace Darling’s biography. Wow. Grace Darling was married to Patrick Rooney. ROONEY? Just last year, I learned that Donna married Thomas Valentine Rooney in 1915. She didn’t marry Sammy until 1926, so it is possible that she was still married to Thomas in 1924, that Thomas’ brother was the Patrick who married Grace Darling. That would mean that the occasional references to Grace Darling being Donna’s was, in part, true. It could be that Grace Darling was the wife of Donna’s brother-in-law — a “sister” of sorts. Again, more interesting research is necessary. The Melba Theater opened in 1921 as the Hope Theater[ii] ; however, the Julius Cahn – Gus Hill Theatrical Guide – 1922 Supplement does not list the theater. According to Cinema Treasures, it was taken over by the Interstate Theatre Circuit and renamed the Melba[iii]. This had to occur sometime before July of 1924 when Donna played there[iv]. About 1960 it was renamed the Capri Theatre and remained so until its closing in the 1970s and its later demolition. 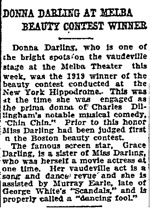 Confirm if Donna won a beauty contest at the New York Hippodrome in 1919. Research Murray Earle and determine any relationship. Determine if the Patrick Rooney that Grace Darling married is related to the Thomas Rooney that Donna married. [i] Dallas Morning News (Dallas, TX) July 21, 1924, Part 1, Page 4 – Via Genealogy Bank. [iv] Dallas Morning News (Dallas, TX) July 20, 1924, Part 3, Page 6 – Via Genealogy Bank.